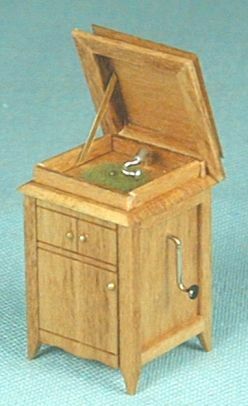 The Victrola - our first 1/4" piece. B J Miniatures has been in business since 1991. We originally started with 1" scale but soon moved to 1/4" (quarter) scale. Our goal is to provide the miniature community with quality quarter scale items at reasonable prices. Both Bruce and Judy have been elected to the National Association of Miniature Enthusiasts Academy of Honor.